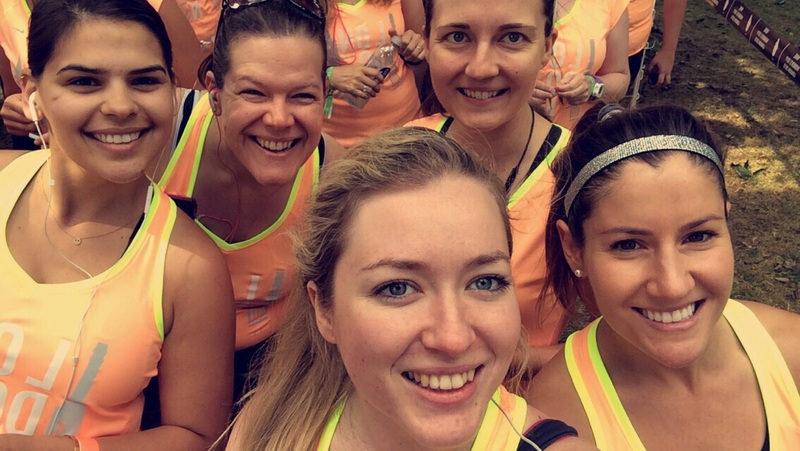 On Sunday morning I took part in the Nike Women’s 10K #WeRunLondon in Victoria Park in East London. It was the first race that I have trained for ‘properly’ since the London Marathon last year. I went in with no expectations or goals other than to enjoy myself. As I lay my kit out on Saturday night I actually felt a bit nervous. Having not raced properly for a while I felt like a new runner again. Excited at what the next day would bring and looking forward to taking part in a big event. Sunday morning arrived and Victoria Park was a sea of orange. The race top for this year came in a choice of vest or T-shirt and I was really pleased to find that the sizing was a bit more generous than last year. No size 12-14 woman wants a ‘large’ top that’s too tight – whether it was a different cut of T-shirt or whether Nike had listened to feedback, this year the large top was exactly that. 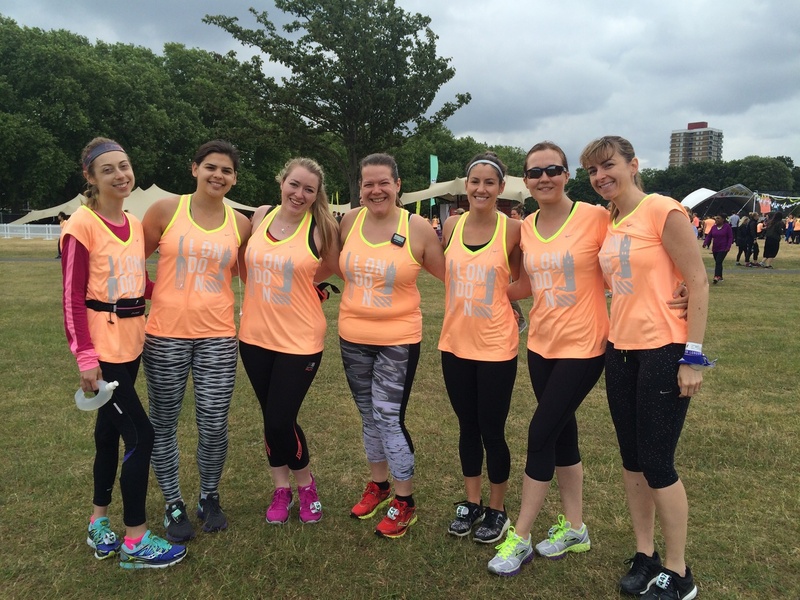 I had arranged to meet up with the Limehouse ladies that I had been training with, the idea was to start together and then run our own races. It was fun to have people to meet before the start and explore the race village with. 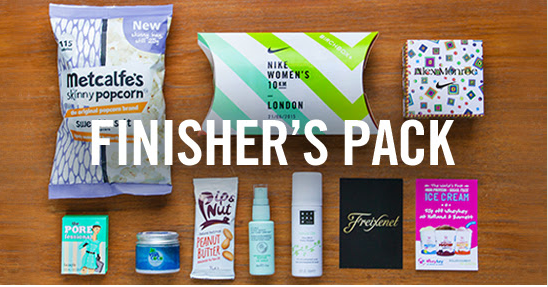 Nike put on a really good event and there were loads of goodies both for sale alongside some freebies from the brands sponsoring the race. Soon we were being directed to our start corrals where we were warmed up – there wasn’t much room in the start pen and it made for an ‘interesting’ warm up – personally I preferred the way it was organised last year with a mass warm up but I can see the benefit of having us all ready to go straight away. Around 20minutes later than the advertised start time we were underway. Our group quickly split up and I was soon on my own, running my own race. Two laps of Victoria Park on a route I was very familiar with. I’d decided to run/walk the race and quickly settled into my rhythm. There was a great atmosphere and everyone seemed to be smiling and enjoying themselves. The weather was warm and the sun put in an appearance. 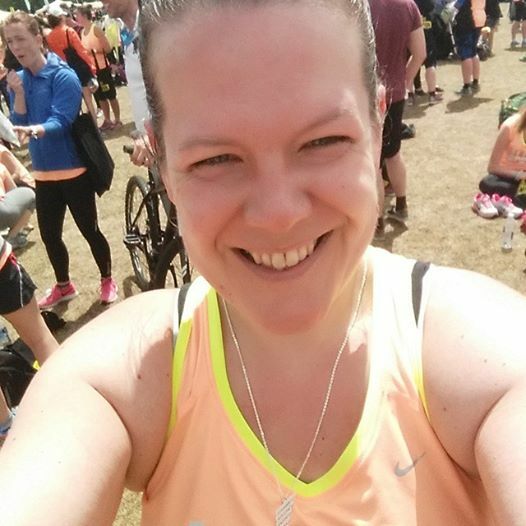 I relaxed into the run and just enjoyed the fact that I was running comfortably again, something which at one point last year, following my post marathon injury I doubted would ever happen. The route was wide and flat, perfect for this kind of event and made overtaking or pulling over to one side to walk pretty easy. Last year this race was run at night and Nike lit up the route like some kind of disco fairy tale. During the day it was more difficult to ‘decorate’ the route and I definitely didn’t find it as absorbing and engaging as last year. However, soon I was on my second lap and over halfway. My pace was consistent, about half a minute per mile outside my PB pace but I didn’t care about that – I was happy just to be there. With 600m to go I decided to start my ‘sprint’ finish. My left calf had other ideas – I felt a sharp pain and my victorious sprint towards the line was reduced to a hobble. Such a shame to finish the race that way, but at least it happened close to the end so I could actually finish. 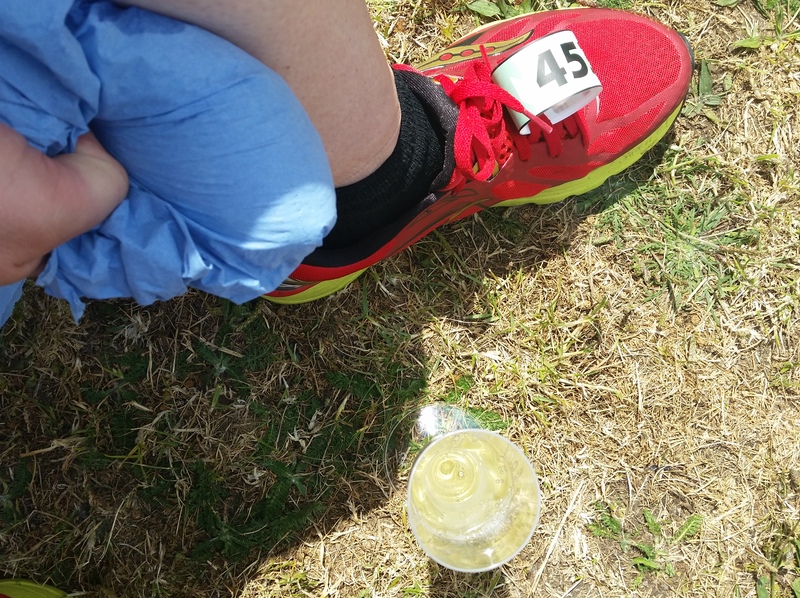 I met up with the ladies, grabbed my glass of free fizz and made my way to the First Aid tent for some ice. Three days, much ice, compression and a trip to the physio later I’m relieved to say it’s just a strain which ought to heal up in a week or so as long as I’m sensible. Overall I really enjoyed this race again. 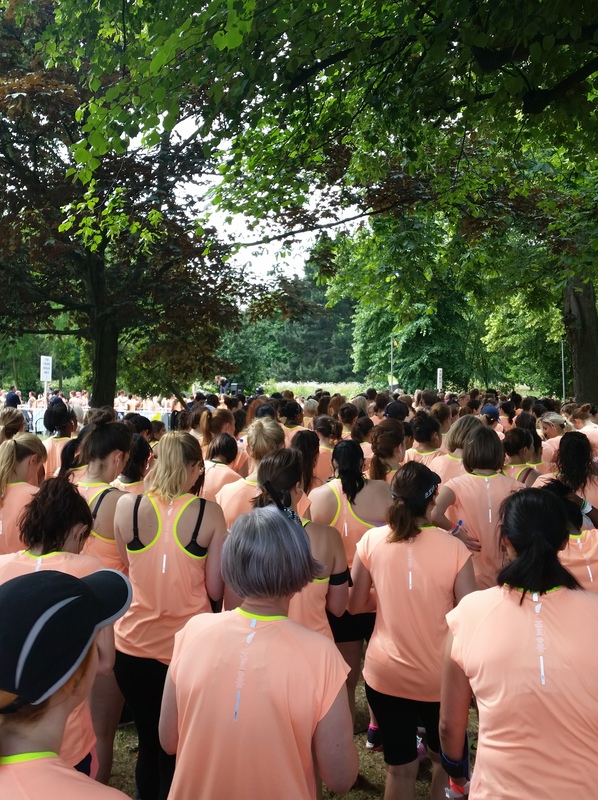 With over 60% of the women there taking part in their first 10K it’s absolutely brilliant for beginners. I also heard of several PBs that day on the lovely flat course. It was really well organised and given that there were 10000 women taking part there were very few queues for anything, including the toilets. I also think it was good value for money. 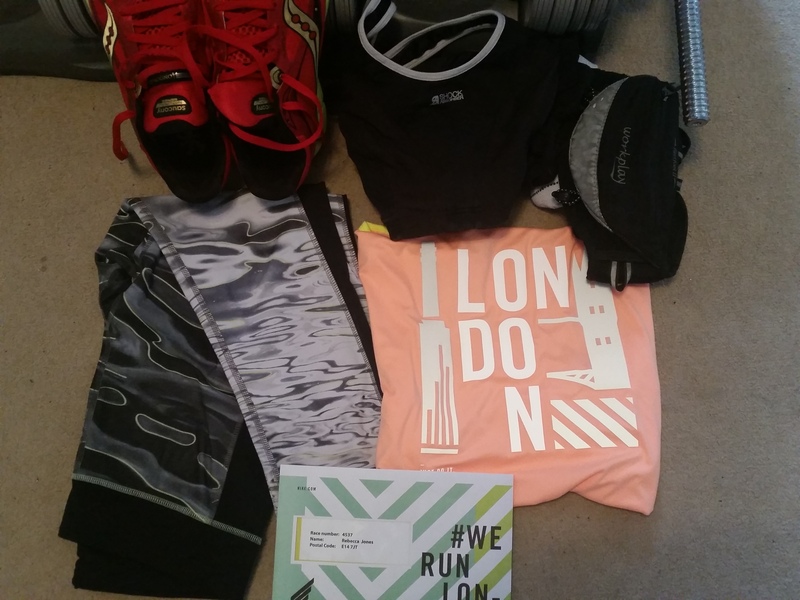 For £28 we got a decent technical T-shirt, free glass of post race fizz, two small tote bags, bananas at the finish line and a decent goody bag plus there were loads of other freebies dotted around the race village. And to top it all a lovely finishers necklace which I’ll definitely wear – far more use than another medal. So while overall I preferred last year’s night race, I still think this one was great and I’ll be back next year. As long as I’m not injured! Previous Rebellion – Week 1 done! Sounds like the night race the year before was a lot of fun. Probably much cooler too! Yeah much cooler! I think it rained though which was the only downside. I’m just catching up on race reports, as a injury-prone runner I’m really sorry that your left calf decided to “play up” when you started to sprint towards the finish. It sounds like the injury will heal quickly and fingers crossed you’ll soon be back running. Do you have any more races planned? Hi – yes thankfully it’s definitely on the mend. Am being really careful though because I don’t want to risk it at all. I don’t have anymore races in the calendar actually although I may end up doing something muddy in Sept/October. Do you know any good 10Ks in the autumn? That’s good to hear. I now spend my life being careful (some might say too careful) but I’ve run on injuries before and am still paying the price. Glad to hear you had an enjoyable race even with your injury, glad it was nothing serious.